King Croacus cares about making the world beautiful. Too bad drinking polluted water has made him insane. King Croacus's official artwork. Note that in-game, his smaller heads do not actually have thorns, except for one of their attacks. 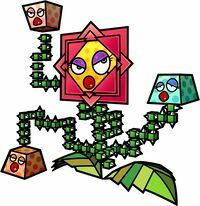 King Croacus IV, usually called just simply King Croacus, is a boss in Super Paper Mario. The flamboyant king of the Floro Sapiens, Croacus adores beauty and spends most of his time brainwashing Cragnons to rebuild his castle full of jewels. He is also the owner of the sixth Pure Heart. He was the regent for King Croacus III until he came of age, and when the young ruler wilted, Croacus IV, popular due to his stabilizing influence, was appointed King. He doesn't care for fighting, but when Mario, Princess Peach, and Bowser enter his chambers, he decides to dispose of them. He resembles a giant flower and is named after the real life Crocus plant. 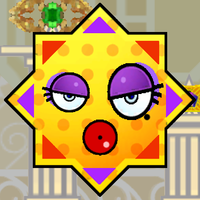 His obsession with beauty may be a nod to another flower named Rosie, from the first Paper Mario. It is notable that in his theme song, a voice saying "I'm a champion", and "Me" can be heard, emphasizing King Croacus's narcissistic personality. He is defeated by jumping onto his smaller heads and then jumping on his normal head when it becomes exposed, or just throwing the smaller heads at the exposed head. His central head is invincible unless exposed, no matter what the heroes do and can even hurt them if they jump on the corners of it. After some time, he loses the rest of his body and floats around on his head, throwing sharp petals at the heroes who must dodge or destroy them and attack Croacus' flying head straight on. He could also have been defeated by using Thoreau to grab one of his smaller petals and throw them at his normal head when it was exposed. After he is eventually defeated, it is revealed that the Cragnons were polluting the waters that the Floro Sapiens drank from, and that King Croacus was trying to save his people by mind-controlling the Cragnons with Floro Sprouts. Upon witnessing the scene, Flint Cragley declares that he will show his tape to the Cragnons, ending the war between the two races. If the player visits Croacus after Chapter 5 but before completing Chapter 7, he will still lie on the same spot on the floor, supposedly dead ("wilted"). The Floro Sapien who is watching over him says that he thinks that Croacus will revitalize, which he eventually does. Following the defeat of the final boss, King Croacus can be found in healthy spirits once again; initially, he will claim his intentions to wage war upon Mario and the Cragnons again. However, he quickly makes it clear that he is only joking and reverts to a more normal personality, saying that most of the polluted water was drained while he 'slept'. He then expresses his desire to begin a new era of peace between the Cragnons and Floro Sapiens. Italian Re Cardo IV Re means King, Cardo is a given name and the Italian word for "thistle". Maybe a pun on the italian name "Riccardo". This page was last edited on April 18, 2018, at 17:40.